When I was really young I had a best friend named Sean. 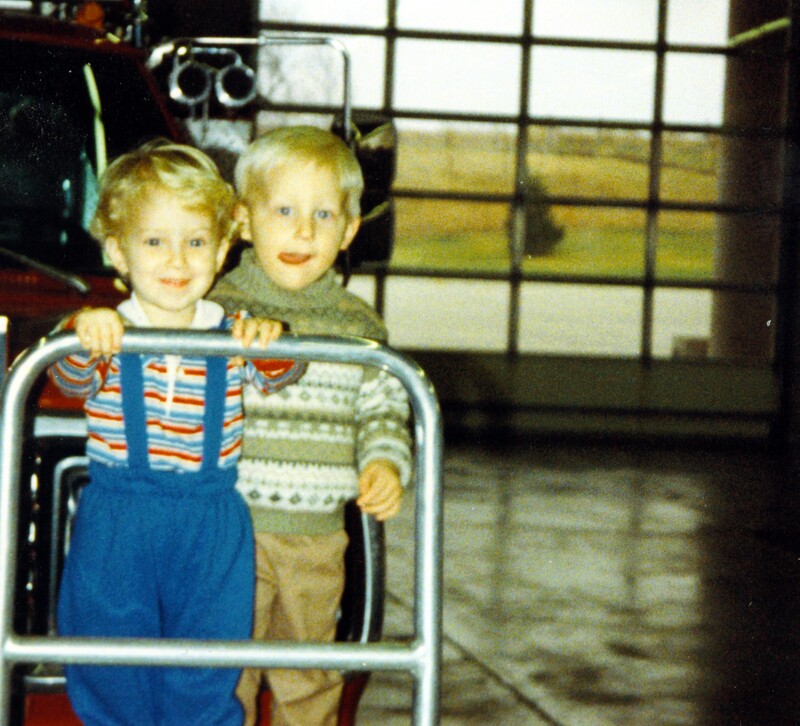 We were about the same age, blonde haired, blue eyed; and considered each other like brothers. See I was the youngest of three children—I have twin older sisters 4 years my superior. Sean, I don’t know. But the point is that we were both in need of familial, brotherly type relations given circumstance. Well as sometimes happens, friends move away; which is exactly what happened with Sean. Sure, I found new friends (I’m great at making friends; keeping them on the other hand…not so much), and I’m assuming that so did Sean; but there was still a void left by his absence. So I began to imagine he was still around. And so began my first experience with imaginary friends. Sean was there, but real Sean didn’t know about it. And while ‘Imaginary Friend’ Sean was based on a lot of what I experienced of the real Sean, I expanded on him; making Imaginary Sean what I would have not only wanted of Real Sean, but of a friend in general. We became, in fact, brothers, Imaginary Sean and I, confidants, and Imaginary Sean was always supportive of my childhood antics and schemes. Funny thing is when I finally met Real Sean years later, I had found that I actually preferred Imaginary Sean over the real thing. He was a better Sean to me. Well so, years past and I found that I had developed a new imaginary friend; this one I called “God.” I’m sure a lot of us might have created the same friend, and many of the traits of our imaginary friends might even line up: Creator of the Universe—EVERYTHING, really; sustainer; go to for problem solving; who we “give” our problems to; and most importantly, “works all things to the ‘good’ of those who ‘love Him’ and are ‘called’ according to His purpose.” I mean, sure, much like Sean, I built up a friend based not only on what I’ve learned about, but also have experienced personally; yet…truth is, my friend God is just as imaginary as my friend Sean (the Imaginary version, not the Real version). Therefore, I decided that I didn’t believe in God anymore. Not the one I can create, craft, control, anyway. Do I even know the real one? I know this because I took a physics 101 course in college. Now, my undergrad was Philosophy, not science, but what that tells me is that even though we can do the Scientific Method and find out all sorts of stuff about the known world, there’s still a lot of…stuff that we don’t know that may be more real than we can fathom. What if something were more real than ‘reality’? Could it appear to have the same properties as something less real–ethereal almost in appearance but nevertheless, more real than reality? What would that make us? Would we then become the ethereal material? Would we become the imaginary friends? You know in many ways I’ve become an atheist lately. I’ve given up knowing the imaginary. Even myself. What do you call an atheist who doesn’t believe he is real? At the end of each of the Gospels, God dies. And yet it’s still included in the story. Like it’s somehow important and ‘Good News’ that God is dead. In John’s Gospel, Jesus just shows up Sunday night after one Hell of a weekend, and most importantly, dying on Friday. Well, so Jesus came through doors locked for fear. Like, he just appeared. Out of nowhere. Or maybe it wasn’t nowhere. Maybe he appeared out of everywhere. And freaks us out. For we thought God was dead. And, and maybe, just maybe, we’re scared because either God’s ethereal and able to mysteriously appear and walk through walls and been seen after death; or, we’re more scared because maybe we’re the ones that are ethereal, we’re the ones that are imagined, we’re not as real as we think and when reality comes into imaginary it can pass through walls and show up wherever it wants because it’s all part of the ‘Creators’ imagination and the Creator can show up anywhere and do anything because it’s His created world, His imagined world. But then he shows his wounds. And the imaginary world and what takes place in it sort of blends with the real one. Maybe even to the extent that the imagineer allows the imagination to kill the reality so that it can connect the imaginary to the real, kind of like a door, or a way; a way from imagination to reality. I’ve seen a lot of cheesy science fiction to know that anything becoming ‘real’ hurts. It’s never a simple process of putting material to immaterial. And usually, just usually, it involves death. In Frankenstein, the monster is created by a crafting together of dead parts. All those people that made up Frankenstein’s monster had to die first before he was created. And it was no easy process to do so either. A running theme in my life lately has been the impossibility sometimes to distinguish between the act of creation and the act of destruction. And more than that, it’s regularly the case that something must be destroyed for something else to be created. Often enough, the two can look so similar that the only way of knowing if someone is creating or destroying is to know the person. But what if the thing destroyed isn’t real, what if it’s the imaginary? Can it still be a thing destroyed? Well it can if the real thing comes into its place. As much as I imagined ‘imaginary’ Sean to be real, the imaginary was dispelled once the real Sean showed up. The question is, do we want it? Or do we prefer the imaginary over the reality? Especially if we discover we’re the imaginary, we’re the product of an imagination. I often find myself agreeing with Atheists over the disbelief in “God.” For I have felt that disbelief myself. Though the more I think on that statement, the more I am forced to realize that it isn’t about me knowing God. But rather the opposite, really. It’s about God knowing me. I mean, even Jesus said in Matthew that there will be those that he will say to, “depart, I never knew you.” It’s like reality knowing us–truth knowing us, Jesus KNOWING US is far more important, than us “knowing” it–Him. After all, if I’m imaginary, the more I’m known the more real I become. And the more real I become, the more I know reality. If I had let go of Imaginary Sean, no matter how awesome I made him out to be, I would have been able to get to know the real Sean. And when I stop believing in my Imaginary God, no matter how ‘real’ I’ve built Him up to be, when I become an Atheist in regards to my imaginary friend, the more I allow myself to experience the real God. Not only that, but the more want to know the real God. So I’m an Atheist. I don’t believe in the God I’ve constructed, the God of my imagination. But I’m ready to meet the real God. No matter how scary. Because the real God shows up when I lock myself away in fear. Fear of what could happen to me, but also fear of the real God. The real God scares me by showing how imaginary my reality is, then says “Peace,” and then shows me his hands, his side, his wounds, his Way for me to know Him. And I become real; not by knowing reality, but by reality knowing me.